A key aim of A Step Up for Our Kids is to provide support within families to prevent children from entering care, or return them home as soon as it is safe to do so. A range of brand new services will be available for parents who are willing to care for their child and need help to develop their parenting life skills to do so. These services will have a specific focus on Aboriginal and Torres Strait Islander families with a view to specifically reducing Aboriginal and Torres Strait Islander children coming into care. A priority in the design of new services is that they are inclusive of Aboriginal and Torres Strait Islander families, appreciate family and community relationships and networks, and are appropriate, accessible and culturally safe. From December 2015, the independent Birth Family Advocacy Support Service commenced. This service will have a dedicated Aboriginal and Torres Strait Islander staff member. 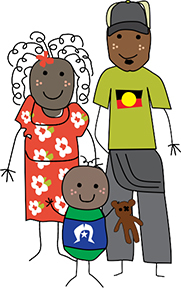 An Information Sheet on A Step Up for Our Kids for Aboriginal and Torres Strait Islanders is available to provide further information.